Some three years ago, I discovered podcasts. Sure, I knew already beforehand that podcasts exist. Yet, as so much in life, one does not necessarily pick up what is offered. This is what happened with me as I ignored podcasts for way too long. In the last years the production of podcasts has been thriving and ever more news outlets bring out their own podcasts. By now I listen to podcasts all the time when I am commuting in Bogotá, need to wait in line or do grocery shopping. It is a great way of using time that I considered beforehand as “lost”. Listening to interesting podcasts helped to like activities like washing the dishes. Which are those interesting podcasts though? To be fair, I only follow podcasts that discuss politics to some degree. What I am looking for are insightful discussions and I come out of the podcast feeling to have learnt something new or get interesting, new perspectives. In the following, I briefly discuss the best ten podcasts in 2016 that I found most informative and worthwhile listening to. My ranking is of course only including those 30 or so podcasts (with a strong bias towards the BBC) that I am actually listening to on a constant basis. All of them you can download for free on iTunes or any other app. Finally, it is not so much about the ranking but rather giving you a hint to a podcast that you might not have listened to so far. The Economist Radio: this was my favourite in 2016 thanks to the diversity of the different formats and in the meantime it even has transformed to a “radio”. It surely has its own biases as it is The Economist after all. However, Anne McElvoy and her colleagues are fantastic hosts and are not full of themselves and their magazine as some others (like Susan Lehman of “Inside the Times” who often comes across as arrogant to me). From our own correspondent: this biweekly format of BBC Radio 4 is bringing fantastic stories from across the globe of BBC’s correspondents. Usually some five stories, intimately told by the correspond, give you the feeling that you are just there as well. Kate Adie is not very present but you just have to like her. Hardtalk: usually three times a week, the Hardtalk team of BBC is interviewing an important personality from across the globe and is putting forward questions that you hardly hear in other formats (and if so they fail as Deutsche Welle’s “Conflict Zone”). Stephen Sackur is doing most of it, and although he is quite arrogant, I just love him for insisting to get an answer, the way he does. Zeinab Badawi is my other favourite host of this show. Analysis: each week, an expert is invited to compile a compelling topic that is challenging conventional wisdom about a certain topic. As it is produced by the BBC, there is a clear focus on the UK but almost always it is presented in a way that you can relatively easily learn for your own country where you are based and will help you to think outside the box thanks to the interesting interviews and arguments brought up. Crossing continents: each week, an analyst of the BBC is covering a specific topic in a country, usually focusing on a topic you do not hear about in the news otherwise. Some of the shows become huge scandals afterwards in the country, as “Stealing innocence in Malawi” proved with the coverage of “hyenas”. Fareed Zarkaria GPS: the weekly show of Zarkaria on CNN brings together almost every week “dream panels” of world known analysts, professors and politicians, mostly based in the U.S. As a former scholar, his section “My take” is interesting and his looks into technological developments are always educative for me. Yet, it is a real pity that he is way too kind with his guests and hardly difficult or follow-up questions can be found. Slate’s Political Gabfest: every week, three American political analysts from news outlets come together on Slate and discuss in a dynamic way American politics. Maybe not surprisingly, there is hardly room for any politics beyond the U.S., and the 2016 Gabfest’s were too heavily focused on the U.S. elections. You have to love the weekly titles of their shows that are surely the most creative ones out there. And you need to love David Plotz with his attempts to create disunity with the other two hosts. 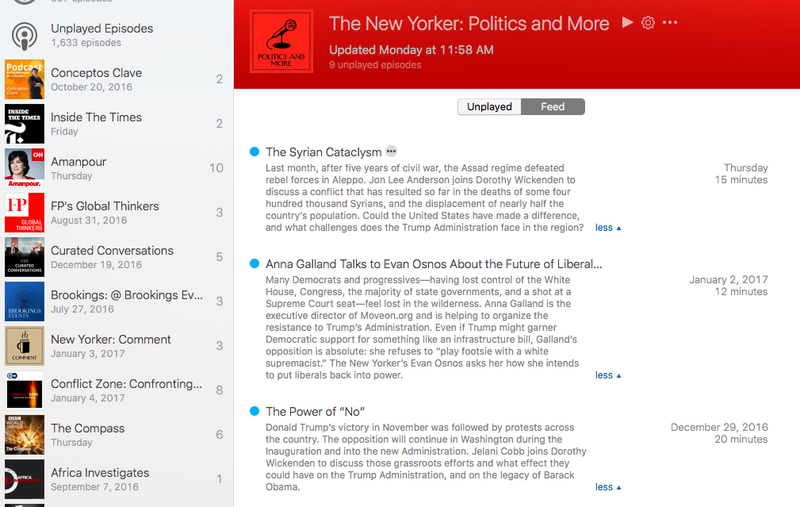 Politics and More: This biweekly show by The New Yorker is hosted by Dorothy Wickenden and include very insightful and interesting discussions, mostly focusing on U.S. affairs. Questions are usually quite challenging for the experts invited on the show, thus one feels also to get more out of it. The World Next Week: If you want to know ahead what will happen politically worldwide, James Lindsay and Robert McMahon of Council on Foreign Relations (CFR) are discussing once a week a couple of issues related to important events. They are usually quite well prepared although you can see that their discussion can be sometimes quite shallow. In general they are trying to cover the whole globe, yet there is still a certain bias towards Europe. The CSIS Podcast: Colm Quinn is interviewing on a weekly basis one of the many experts of CSIS, one of Washington’s most influential think tanks. The interview is always about a single issue, almost always referring to a country as a unit of analysis instead of global topics. I hope that at least some of the podcasts very briefly discussed above also motivates you to download them. Also, I would be glad to hear about your favourite podcasts that you are listening to. Next The book “Get the truth out of truth commissions” is out! Thanks for sharing these, will check out some of the BBC ones. I also use podcasts in similar fashion. Nothing like learning something interesting while doing something mundane. Podcasts I currently have on my feed include: Intelligence Squared U.S. Debates–wide ranging Oxford style debates, website offers research material referenced in debates. Hidden Brain–science and storytelling for curious people, Snap Judgement–Storytelling with a beat, LSE Public Lectures and Events–talks and sometimes debates on wide ranging subjects, Get-Fit Guys’s Quick and Dirty Tips to Slim Down and Shape-up–Excellent name! but value is in the short clips on various fitness nuggets. Thanks for sharing, Ismaila. I was not aware of the podcasts you mention, in the past I listened to Intelligence Squared US Debates. Lots to explore!